mypurchase is one of the software module offered by wolke business suite which is designed to cover your entire supply chain and procurement process by managing expenditure in multi-currencies, streamlining departmental or divisional requests, recording quotations, managing tendering processes and purchase orders, documenting delivery notes and invoices, tracking payable aging and cash disbursements through multiple bank accounts. mypurchase is a totally document-driven purchases and accounts payable management software with full-fledged multi-level workflow and multi-level authorization limits. It is a true electronic paperless system from the departmental request till final payment. All Departmental requests whether to be routed to the store or to purchase order can be processed through the Departmental Request module of mypurchase. All authorizations required and workflow level approval can be built in with ease till the request form reaches its destination. The request for quotation can be generated to the registered vendors who sell the requested products and any extra vendors can be added, either upon receiving the Departmental Requests or directly. Vendors’ price lists can be viewed if provided. mypurchase allows direct issue of purchase orders or through Vendor Request for Quotation. The Purchase order is controlled through the workflow and through the authorizations limit. All Deliveries received can be confirmed against the original purchase orders. All accounting entries, financial obligations and budget reservation and release are considered during posting. Direct invoices such as electricity bills or telephone bills, or indirect purchases which are against deliveries can be posted. Budget control is verified and scanned copies of the original documents can be attached. Direct payments or payments against invoices can be made. An Invoice due-for-Payment alert is a built-in feature in mypurchase. All types of payments such as cheque, transfer, a/c to a/c etc are available. Document printing upon task completion. Managerial, operational reports and inquiries for every process. Drill down facilities to the lowest transaction processed by mypurchase. Simply it is your tool to make a decision. mypurchase module will produce all necessary documents and display all its contents as per your preferences and parameter setup. mypurchase being fully multi-currency means that you can input your purchases in any currency and the system will handle all necessary conversions at the time of posting. The system has a full-fledged vendor profile and sub-ledger that can be accessed internally customer through the Intranet or externally through the Internet. Emails, document management and many other features to control and manage your vendors are incorporated. 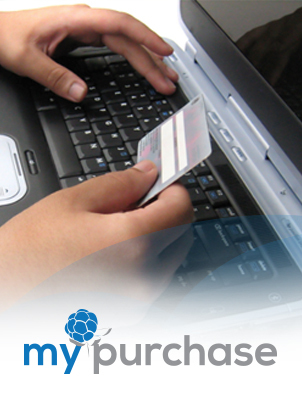 mypurchase makes your vendor a part of your own organization. Full mypurchase transactions and payments history is also available in a more sophisticated format in the report generation. Whenever needed, an online context sensitive help system pops up to assist and guide you through all the procedures. Our manuals provide extensive and comprehensive details to your staff so they can derive the full potential and beneficial features of mypurchase. The sort/filter facility on any field and the drilling down to original order line, payment allocation, and delivery status will give you the database image that you need at any time. Available on three platforms: browser-based Intranet/Internet and cloud computing. Online real-time posting, resulting in online real time financial reporting. Bilingual capability: Arabic/English, you log into the system with the language of your choice. Document printout option upon any task per formed. Multi-level access to the system and powerful central security control. The browser interface (totally thin client) for Intranet and Internet use; for easy installation and access from anywhere and anytime, totally user-friendly. MS express database for reliability, security, ease of use, easy upgrade to MS SQL, powerful data search and other system interfaces. RDBMS technology for the highest level of data integration, safety and genuine on-line real-time processing allowing for an immediate control of the company’s activities. MS Asp.Net & C# as development tools for highest reliability, security & efficiency. wolke is a collection of business and accounting solutions offered on Cloud in order to manage the operations of any kind of business. Its totally flexible parameterization allows users to map their own policies and procedures to have a product of their own.